STEVE YEOWELL is a longtime collaborator of 2000 AD. He studied 3D Design at Sheffield Polytechnic, where graduated in 1984. His first published work was in independent comics, most notably the strip ‘Lieutenant Fl’ff’, which he took over from Mike Collins and Mark Farmer in Swiftsure of Harrier Comics. He has worked a lot with writer Grant Morrison, starting with ‘Zoids’ for Marvel UK. He did fill-ins on ‘Action Force’ and ‘Thundercats’ until he worked with Morrison again on ‘Zenith’ in 2000 AD in 1987. 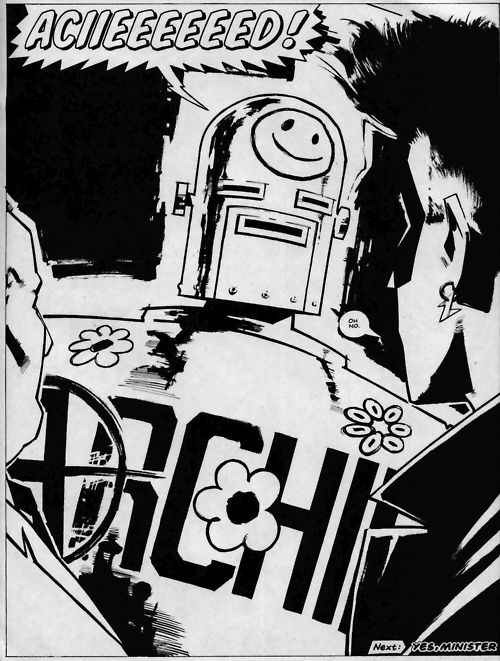 ‘Zenith’ became one of the most popular series of 2000AD. Yeowell was then hired by American companies and has worked on ‘Batman’, ‘The Fantastic Four’, ‘The Invisibles’, ‘JSA’ and ‘Starman’. He continued his cooperation with Morrison on series like ‘Sebastian O’ and ‘The New Adventures of Hitler’. Later on, Yeowell also created ‘The Red Seas’ with Ian Edgington for 2000 AD, and ‘Red Fang’ with Steve Moore.